Now you have created your landing zones and web capture forms for your preference center you need to create groups for each contact rule you previously created. Once you have selected 'Create a new Group', giving it an appropriate name e.g. 'Events Centre' you will be taken to the group screen. Here you need to add a rule. To do this click 'Add Rule'. 1. 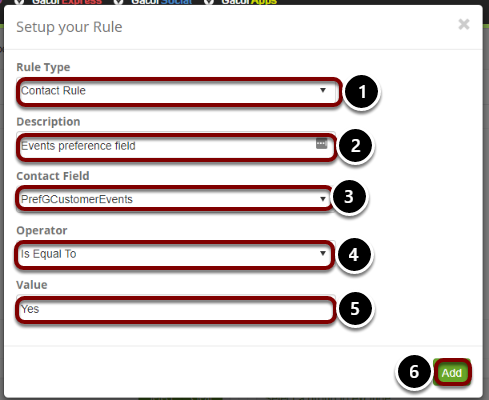 Select the rule type. This will be a contact rule as it will search the contact record for people who have a certain value in for the preference field you created. 2. Give it a description that reminds you of what it is for. 3. Select the relating contact field. In this case it is for events communications, so we have selected the PrefGCustomerEvents contact field. 5. Use the value you put for the contact field i.e. Yes/No, 1/0, True/False. You will need to create a new group for each preference field you have created.